Drawing chibis (big heads and small bodies) that are seen in manga is easy and cheap if you use Chibi! : Official Mark Crilley How-to-Draw Guide. All that is needed is some nice bristol paper, a regular pencil, a pencil sharpener, several pens with a variety of tip sizes, a 15” clear ruler, some kneaded erasers and some practice time. Mr. Crilley starts simply with the basic chibi girl and boy including their hairstyles, clothing and manga emotion symbols. In Part 2, he includes some more advanced poses like panda, fox, witch, fantasy, kissing and action. The chibi dog, cat and robot are adorable. Part 3 gives 78 ways to use your new drawing abilities including cards, signs, t-shirts, stickers, buttons, rubber stamps, pop-ups and calendars. My favorite, and sadly lacking, ability was to create a chibi that looks like a real person. Chibi! 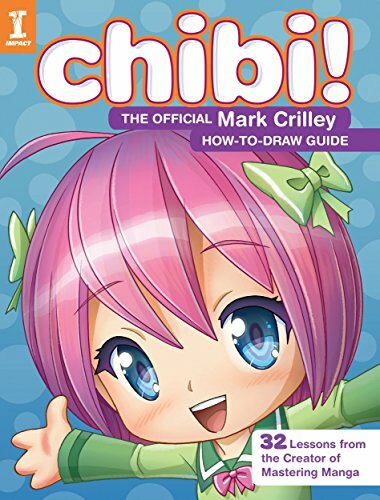 : Official Mark Crilley How-to-Draw Guide would be an excellent gift for the manga fan in your life. If they are already into producing art, it would also be nice to include those items listed in the first paragraph that they are lacking. I have been asking my daughter, an A+ art student in high school, to make my face into a manga character for my blog. She has let me down for over 13 years. Now I can do it myself…with substantially more practice. I would highly recommend purchasing the paperback version of this book. The kindle version is hard to read on a kindle as some of the illustration break over several pages. On a larger tablet, the kindle version is fine. However, if the reader wishes to use tissue paper to copy the chibi examples to get a head’s start on their own drawing (please don’t judge), a tablet won’t be easy to use. 5 stars! Thanks to the publisher, Impact Books, and NetGalley for an advanced copy. There is also a review of a more traditional art instruction book using pencil located here.